Robert is the training manager of a large multinational electric power company. Recently, his company purchased a new Supervisory Control and Data Acquisition (SCADA) system. Robert was put in charge of training more than 20,000 technical personnel on the system, working in the company’s power plants across 16 countries. He was given only a month to accomplish this task and a budget of USD 12,000. Many training managers face a similar challenge. Most companies in sectors such as manufacturing, petrochemicals, and energy use complex technologies. The staff of these organizations needs to be trained on these technologies effectively, in short time, within limited budgets. How can firms meet this critical need? Well, they need to go for the online learning format. Why should companies use e-learning to train their technical people? As we have seen, companies need to train their technical workforce quickly. An e-learning course of 60 minutes can be developed in just three weeks. The facility to roll out courses rapidly makes the technology-enabled learning medium very useful to deliver technical training in a short time. Traditionally, companies hired specialists in the concerned technology who had good training abilities, and, this was an expensive proposition. According to a report by salary.com, the average annual pay of a technical trainer is $66, 399. Instead, you can now develop an online technical training course for just a fraction of this amount, and, this is a one-time expenditure. You need to develop the e-learning material only once and use it as many times as you need. Furthermore, you need not take your people away from work for training, as online courses can be accessed anytime, anywhere. This ensures the productivity of your staff is not affected by training schedules. Imparting good technical training in multiple languages is a major challenge. Firms often find it difficult to hire technical experts who can train their staff members in their native languages. This problem can be overcome using e-learning courses. Online technical courses in English can be well-translated into multiple languages easily, thereby enabling non-Anglophone learners acquire the required skills. Check out the eBook Delivering LOCALIZED training to your GLOBAL workforce to know more about e-learning translations. How can online media be used to impart technical training? Videos are a great way to train service technicians. Short, animated videos are very useful to make learners aware of and impart knowledge about equipment. One of our clients in the petroleum industry used animations to train its rig operators on a new piece of equipment. 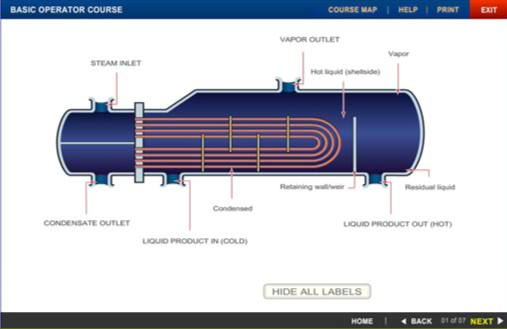 Here is a screenshot from the course. It is also a good idea to use “real” videos to train service staff. Experienced technicians can be asked to troubleshoot equipment or perform a task, and these activities can be captured and used to train other technicians. For instance, one of our clients in the medical device industry has created several video-based e-learning courses where the procedures to repair hospital beds were captured. These online courses offered a “live” learning experience and went a long way in improving the performance of its service technicians. 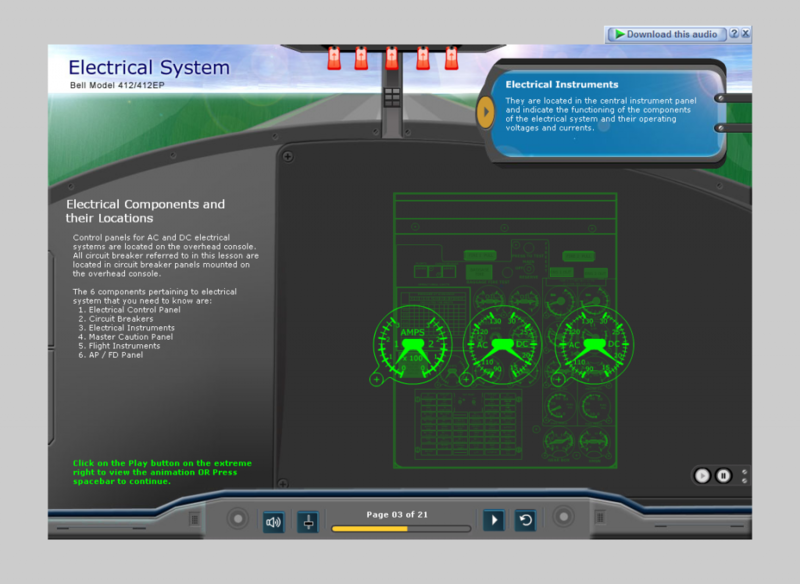 E-learning courses enable service technicians participate actively in the learning process, by allowing them to explore each part of the equipment they are being trained on. In one of our courses developed for a client in the oil and gas sector, we used hotspots to explain each part of a drill bit used in oil rigs. By clicking each hotspot, they learned the names of each part and their features. Simulations are ideal tools to enable learners practice their skills and hone their abilities. 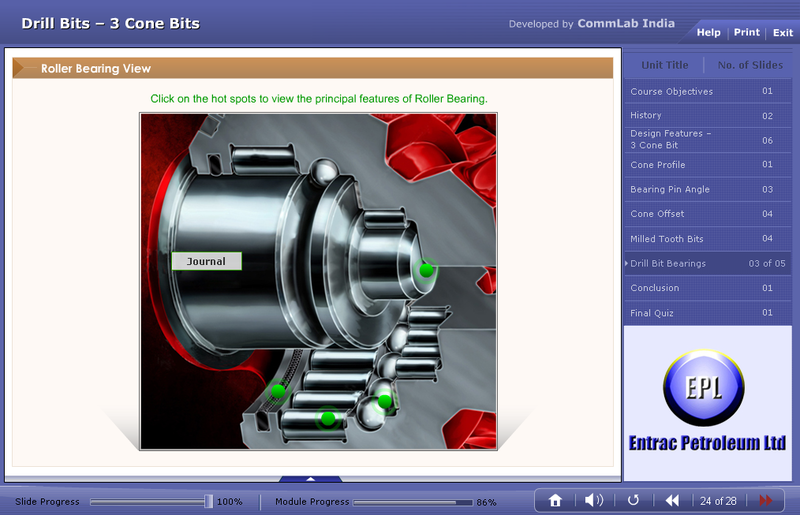 These instructional tools help create “real-life situations” and provide learners with a platform to learn, practice, and master the tasks involved in repairing machines and experiment with different options in a risk-free manner. For instance, in one of our courses designed for aviation technicians who double up as helicopter pilots, we used simulations to impart training on various controls. The simulations helped learners know how each control worked, and they could experiment with the controls. They could “learn” the consequences of making an error or pressing a wrong button. This enabled them to gain knowledge of the equipment as well as the ability to apply it on the job. Here is the screenshot of the simulation. Thus, you can use e-learning to deliver good technical training. How do you intend to train your technical staff? We’d love to know.